Does the Storyteller know other stories? Why did you tell me this story now? What conclusions can I draw from your story? Where can I find more information about this story? 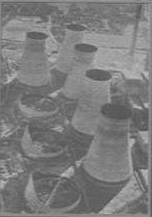 Ferrybridge cooling tower during its collapse in 1966. This was one of the most spectacular cases of collapse in the modern history of structural engineering. Right, the group of towers after the collapse. One of the Ferrybridge stations as they look today (photograph by L. Godoy, 1998).